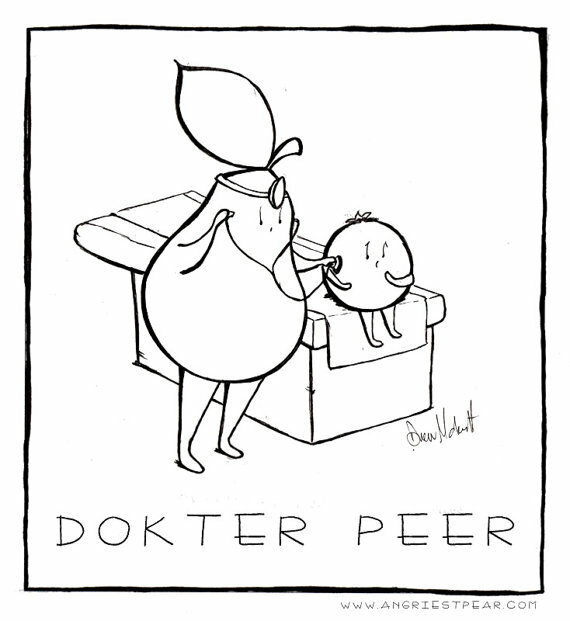 A few months ago, Esther, a very nice woman in Europe (probably the Netherlands given the Dutch description), contacted me about doing this custom drawing (a doctor pear tending to a sick blueberry). She wanted to give the picture to her friend as a gift for finishing medical school. 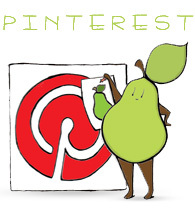 I LOVED the project because their nicknames for each other are pear and blueberry– very cute! 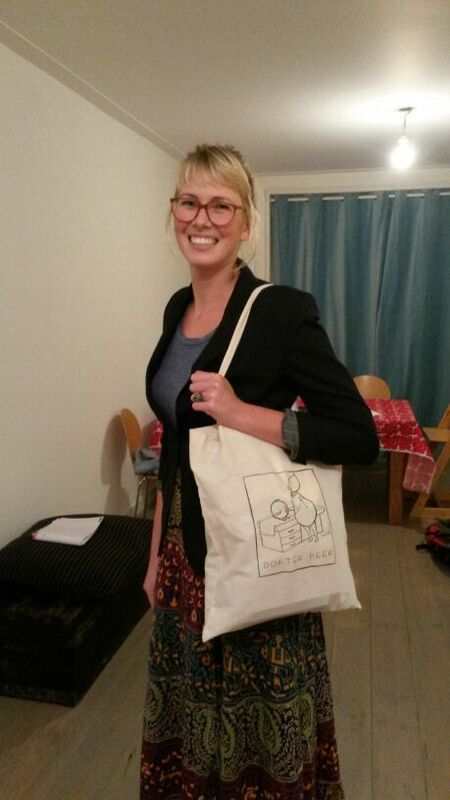 Esther ended up putting the image on a bag for her friend, and I think it looks amazing! I am always interested in making custom drawings / prints. If you’re interested, you can contact me through Etsy or email me at drew[at]angriestpear[dot]com. 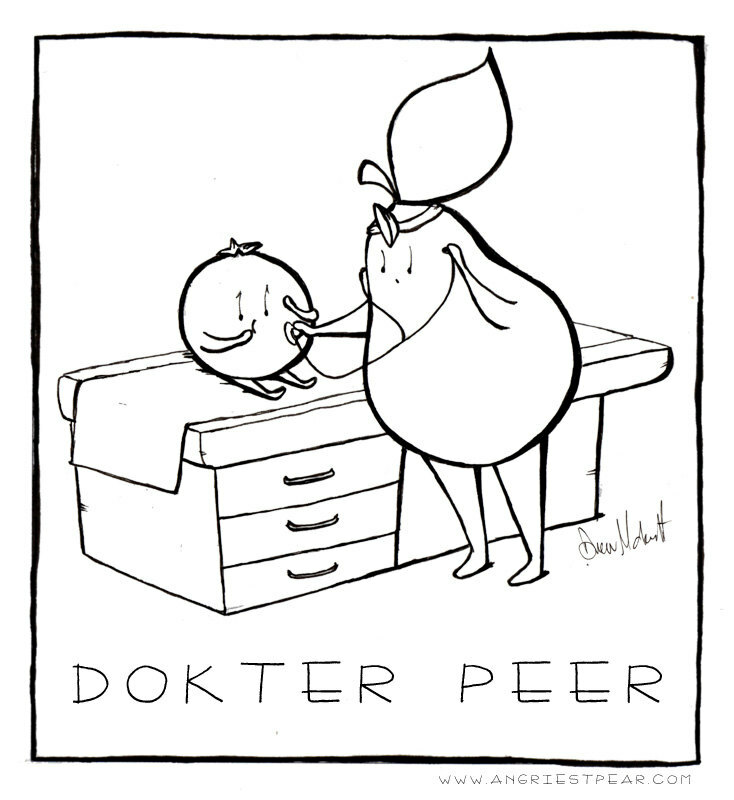 Categories: Custom Work | Tags: anthropomorphic, blueberry, comic, custom drawing, cute, doctor, fruit, humor, illustration, Pear, tote bag | Permalink. Thanks! I thought it was such a cute idea! I loved working on this. I’d like to get into custom stuff too. Few people asked to use cartoons or asked me to make one per topic. I did just free as gift. But it costs a bit of money to keep on line store, right ? Yeah, it costs a bit. I use Etsy, which is okay. I feel like it’s hard for buyers to find your items, and you’re responsible for shipping etc, and taking pictures of everything. In terms of costs, Etsy is relatively low. They charge a small fee to list items in your shop and they take a small percentage when you make a sale. It’s also helpful to have a PayPal merchant account with Etsy, and PayPal takes a small fee for every sale. But it’s better than paying a monthly fee (at least for me). I’ve also heard of a lot of artists using Society 6 (but I haven’t looked into it that much to give any opinion of it), but you might look there as well. Another option I’ve seen people do, is to get a PayPal merchant account (the one with no monthly fee), then just add the PayPal buttons on your website. If you want to talk to me more about this, feel free to email me. I’m no expert, but I’m happy to share my experiences!